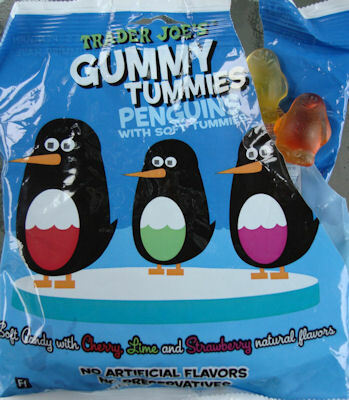 I don’t like gummies. I don’t even remember why, it’s been so long since I tasted any. So why did I buy these? Because I can’t resist anything animal-shaped. And I couldn’t resist the peculiar appeal of an animal-shaped candy with a gut full of liquid. To be honest, I didn’t really expect these to be good to eat. I expected that I would order an Avenging Narwhal Playset from Archie McPhee and then instead of having the narwhal spear the little plastic penguin through the belly, I’d use these. And they’d OOZE GUTS. And I’d take pictures. What could be better? But I never got to do that, for a surprising reason: They all got eaten! Yogurt-covered dried fruits have been around forever, and with the recent interest in probiotics, it looks like yogurt-flavored candies are making a comeback. Unfortunately, the dirty little secret is that modern science canâ€™t yet convert pure, wholesome yogurt into a form that can be used to coat things. What youâ€™re really getting with 99% of yogurt-flavored candies is white mockolate with a touch of yogurt powder for flavor â€“ and no matter how many live bacteria you cram in there, thereâ€™s no getting around the fact that the stuff is more likely to kill you than make you live longer. Anyway, hereâ€™s a new product from a company known for making healthy things like grape juice – Welchâ€™s Fruit and Yogurt Snacks. (This All Candy Expo sample is cherry, but I believe they had other flavors on offer as well.) 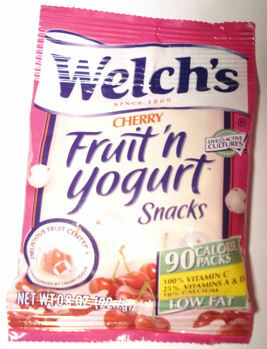 Welchâ€™s original fruit snacks had a steady presence in my school lunch bags in days gone by â€“ they had a relatively high concentration of fruit and were tasty enough, if I recall correctly. For a while it looked like you’d never see another non-chocolate candy review from me. 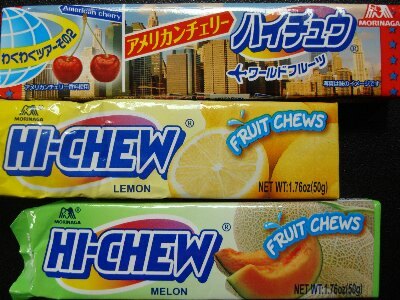 I discovered that my local Japanese markets are now carrying the Mango flavor Hi-Chew that I reviewed so enthusiastically a while ago. I bought a large quantity and felt that now, my life was complete. Well, as far as non-chocolate candy goes, anyway. But curiosity got the better of me. After all, a package only costs a buck. If the mango is so good, maybe there are other wonders that I don’t want to miss, right? So I grabbed a Lemon and Melon at the store. And then while ordering something else from J-List, I saw a flavor called “American Cherry” and wondered what the heck that was, and it only took one click to find out, right? I think if you were to look at the latest generational candy trends, youâ€™d see that the combining of flavors is in. Think of the recent additions to product lines like Skittles Crazy Cores and others. As such, there was certainly no shortage of candy mixing at the All Candy Expo. Gum, mints, gummiesâ€¦ itâ€™s all the rage. One completely sneaked by under my radar. 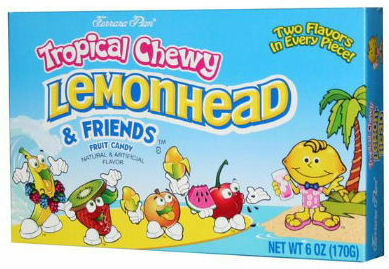 The new Tropical Chewy Lemonhead & Friends by Ferrara Pan. When I glanced at the box, I assumed that there were just going to be tropical counterparts to the Chewy Lemonhead and Friends variety I adore. It wasnâ€™t until I popped one in my mouth and then examined the packaging closer that discovered these are in fact another candy with two flavors per piece.